(MENAFN Editorial) Zion Market Research has published a new report titled 'Offshore Support Vessels Market by Vessel Type (Anchor Handling Tug Supply (AHTS), Platform Supply Vessel (PSV), Multipurpose Support Vessel (MPSV), Standby and Rescue Vessel, Crew Vessel, and Others), by Depth (Shallow Water and Deepwater), and by End-User (Oil & Gas and Offshore Wind): Global Industry Perspective, Comprehensive Analysis and Forecast, 2017 2024. 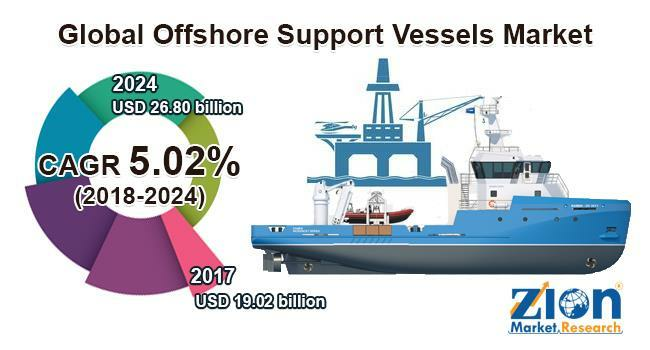 According to the report, global offshore support vessels market was valued at approximately USD 19.02 billion in 2017 and is expected to generate revenue of around USD 26.80 billion by the end of 2024, growing at a CAGR of around 5.02% between 2018 and 2024. The System-Based Design (SBD) method is applied in the design of offshore support vessels (OSV's). This method is effectively applied in the development of large number ship designs, mostly in cruise ships and ferries. International Maritime Organization (IMO) is the worldwide standard-setting authority for safety, security, and environmental performance of international shipping. The IMO forms a regulatory framework for the shipping industry, and it has been adopted and implemented globally. Several guidelines have been formed for operation, construction, and design of offshore support vessels which is used in the transportation of restricted amount of hazardous and toxic liquid substances in mass for the servicing and re-supplying of offshore platforms, drilling units in offshore and other offshore installations. Such factors are expected to drive the offshore support vessels market growth over the forecast period.